I bought a different Sencore (LC 103,) and have no need for this any longer. I Have used this particular unit for a year and know it's working properly. Sold AS IS, NO WARRANTY. Model COLORPRO III. Part # COLORPRO III. Make: Sencore. The actual analyzer is not included. Model / Part #: Not Listed. Sencore Videopro Multimedia Video Generator - VP400. 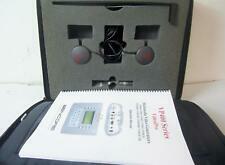 Listed is this universal video analyzer from Sencore, model VA62. Get Supersized Images & Free Image Hosting. Sencore Model LV75 Capacitor-Inductor Analyser. Pull out sheet on bottom is missing original chart. Good Overall Condition General scratches,scuffs and wear (See Pics). Gordon LaSalle Music. Sencore Universal Video Analyzer Broadcasting Machine Model VA62 NTSC Format Turns on. Untested.Sencore Universal Video Analyzer Broadcasting Machine Model VA62 NTSC Format Turns on. Untested. Unit powered up, but due to lack of knowledge no further testing was done. We test to the best of our ability.